Federal’s high-resolution, slow-motion video-graphy helps demonstrate which loads are the best for specific uses. The ultra-slo-mo footage provides a detailed view of each bullet penetrating ballistic gelatin blocks. These blocks closely mimic animal tissue and clearly display performance characteristics. “The Bullet Breakdown Video is a great tool for hunters trying to decide on ammunition type,” said Federal’s Jason Nash. “Properly preparing for the hunt is crucial-and not all bullets are made the same. The bullet is the one link between hunter and game and can be the difference between success and failure. 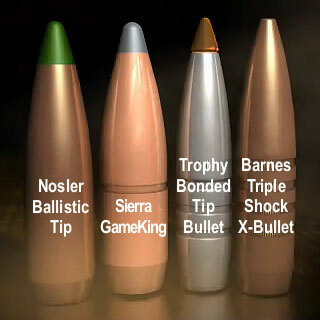 This video helps show hunters how different bullet construction affects terminal performance[. ]” For more info, visit www.FederalPremium.com. Share the post "Super Slow Motion Video Reveals Hunting Bullet Performance"
E. Arthur Brown has just started stocking Barnes Bullets. To promote this new line of projectiles, EABCO is offering “Lowest Introductory Internet Prices” on some of Barnes’ most popular bullets: Triple Shock (TSX), Tipped Triple Shock (TTSX), and Varmint Grenade. The folks at EABCO explained: “We figured the best way to launch our Barnes Bullet Line would be to offer the most popular bullets at the lowest prices. The good people at Barnes gave us a ranking by sales volume, so we picked the top 20 (and added three personal favorites), to come up with the listing you see on the right”. To sweeten the deal, EABCO is offering flat-rate USPS shipping. EABCO will charge just $8.00 to ship up to 20 boxes of bullets. Mix and match bullet types and bullet brands if you want. The $8.00 shipping offer applies to Berger, Hornady, and Lapua bullets also. But you need to select “$8 Bullets Only Shipping” during check-out. If you buy a large quantity of bullets, you can save a bundle with that shipping offer. TSX bullets are widely known for their accuracy, consistent expansion on impact, and solid, weight retention. The “Triple Shock” name refers to the three grooves formed into the bearing surface. The Tipped Triple Shock is an enhanced-BC version of the Triple Shock with a polymer tip instead. Barnes claims that the higher BC of the TTSX tipped bullets provides a flatter trajectory for long-range shots. The popular lead-free Varmint Grenade bullets combine a composite (lead/tin) frangible core with a hollow cavity and copper jacket. These are designed to virtually disintegrate inside predators, minimizing pelt damage. Watch the video below for a dramatic demonstration of how Varmint Grenades perform when launched a very high velocities. Share the post "Good Deals on Barnes Bullets at E. Arthur Brown (EABC0)"